Tisserand Aromatherapy is known for its purity and quality. Whether you are looking for pure essential oils, massage oils or pre-blended aromatherapy products, Tisserand presents authentic, passionate and quality aromatherapeutic products. For bath time bliss, Tisserand offer a selection of distinctive and luxurious Vegetable Soaps, Bath Soaks, Bath Oils and Shower Gels. And for harmony around the home, there is a wide variety of vaporising products to complement every room, every mood and every person. 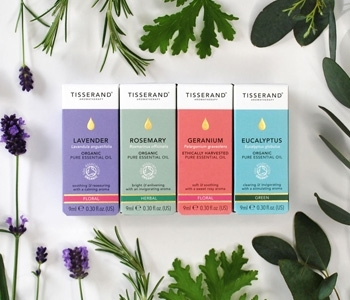 Tisserand is the brainchild of Robert Tisserand, a passionate aromatherapy advocate whose foray into the world of essential oils began in the 60s at the age of just 17. His vision was to bring the spiritual and corporal healing of essential oils into everyone's home; a pioneering move for the time. Robert built upon his experience as both a student and a practitioner of massage therapy in the intervening years until 1974, when Robert created the precursor to Tisserand: the Aromatic Oil Company. He hand-bottled the oils from his bedroom in South London, and despatched them to customers from his local post office once a week. In 1985 Tisserand Aromatherapy was created with Robert at the helm as the essential oil and formulations consultant. From humble beginnings, Tisserand is now a global company with an emphasis upon healing, quality and the enhancement of well-being. From essential oils to bath soaks, candles to hand cream, Tisserand delivers the definitive aromatheraputic experience in your own home every day.